The small land birds of Galapagos are particularly vulnerable to an invasive, parasitic fly species named Philornis downsi. Present on 14 islands and frequently causing up to 100% nestling mortality, immediate management actions are necessary to stop the extinction of one or more Galapagos land birds including the famous Darwin’s finches and mockingbirds. 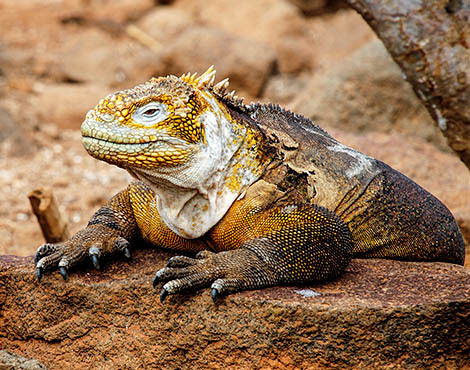 The isolation of the Galapagos Islands, 600 miles out into the Pacific Ocean, has resulted in over 1,300 species of flora and fauna that are unique to the Islands. This same isolation leaves them particularly vulnerable to introduced species which are still their greatest threat. 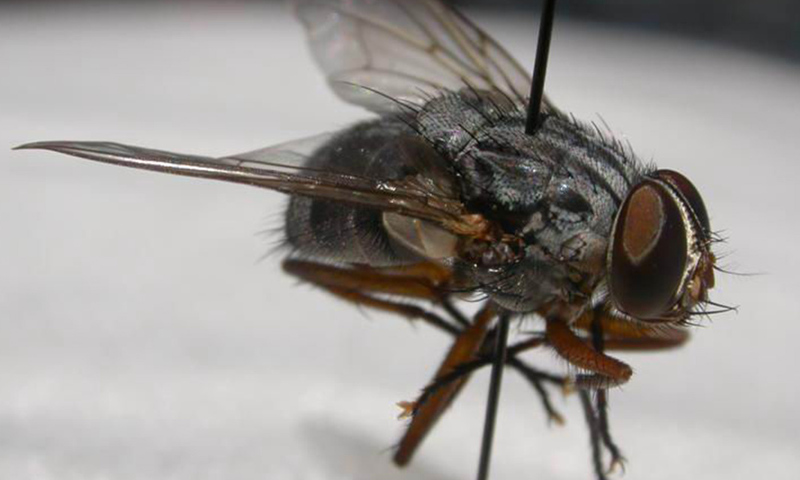 In recent years an invasive parasitic fly, Philornis downsi, has begun to have a devastating effect on the land birds and in particular, Darwin’s finches and the mockingbirds, including the critically endangered mangrove finch. Since the introduction of P.downsi (interestingly, this species has never been given a common name) to the Galapagos Islands in the 1960s, it has spread to at least 14 islands in the Archipelago and is known to cause morbidity and mortality in at least 12 species of birds. The life cycle of P.downsi includes a parasitic larval stage, which feeds at night on the blood of nestling birds, and a free-living adult that lays eggs in bird nests containing young. The larvae continue to develop in the nest as they parasitise the birds. 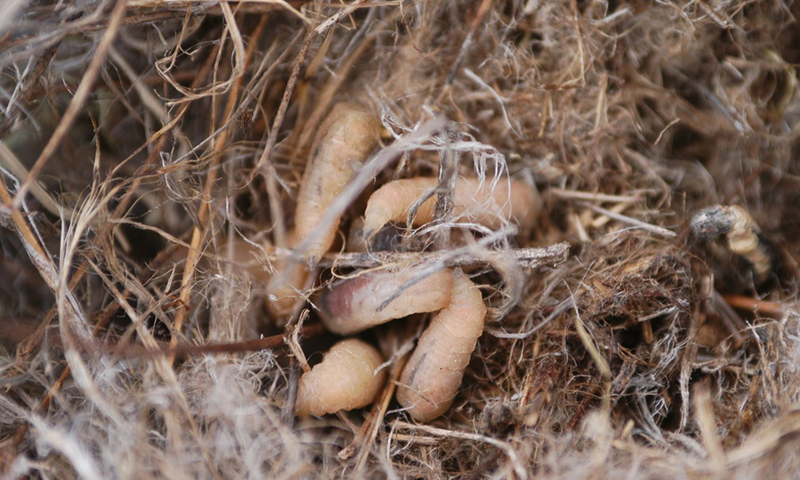 For example, one nest of a cactus finch (Geospiza scandens) that contained a brood of four chicks had 170 larvae present, which is 42 larva per nestling. It was no surprise when none of the nestlings survived. In addition to direct nestling mortality, which is proven to be as much as 100%, a number of studies have confirmed that surviving nestlings often have deformed beaks, reduced growth rates, and anaemia. Between 2008 and 2015, thanks to our supporters, GCT provided funding for research into control methods for this deadly invader. In 2012, we co-funded an international workshop that included local organisations and authorities, researchers working on P.downsi, and international experts to identify what management tools we have at our disposal. With the growing list of threats that finches and other terrestrial birds face today in Galapagos, it becomes even more imperative that management measures are implemented. 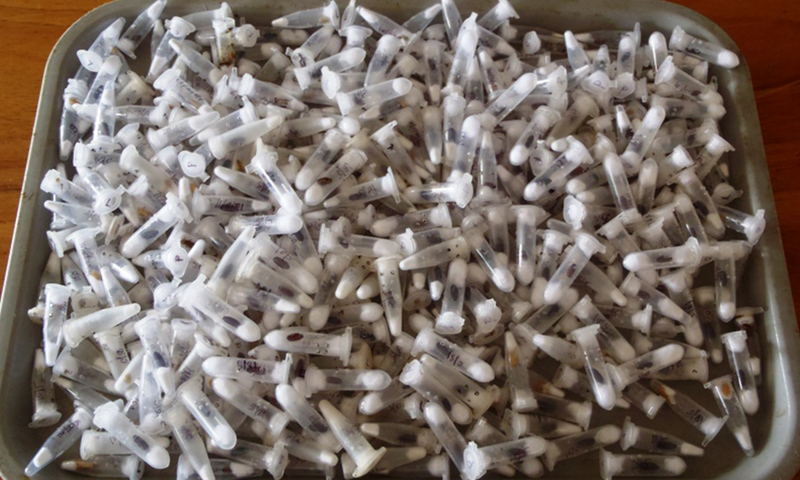 Options for control may include fly trap attractants and insecticide use at a local scale; and biological control using a wasp which in turn parasitises the P.downsi larvae. If you are looking to help, why not donate today or become a GCT member.